The dandy style never goes out of fashion. It's back in vogue also in this fall/winter season. The colors of the new "Hoxton" dress shoes by GuidoMaggi, match perfectly with the timeless style that belonged to Oscar Wilde. The upper in a warm navy blue full-grain leather and 100% natural cotton and the inner lining in soft goatskin give the Hoxton that british charme together with that know-how of the Italian craftsmanship. The Insole, the midsole and heel with anti-slip rubber are in genuine leather, assembled and sewn by hand. 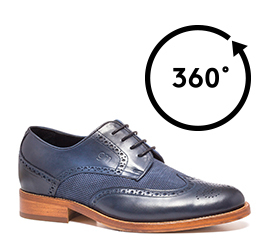 The new "Hoxton" are must have shoes 100% handmade in Italy. GuidoMaggi's artisans and designers allow you to customize your shoes. The inner increaser. invisible and anatomic can be chosen between of 2.4 , 2.7, or 3.1 inches depending on your style needs.